New to iFISH? 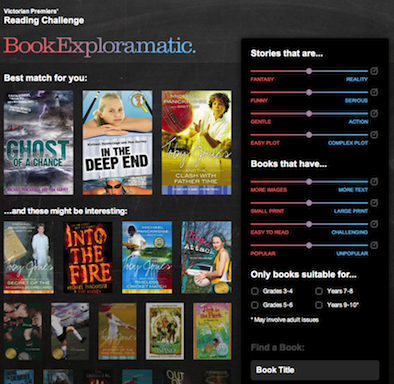 Get a sense of what it can do by playing with our book-explorer at bookfish.net.au. Here is a 2-page blurb about iFISH concepts (PDF). And if you are designing an iFISH idea, here is a list of slider themes that we have played with (rtf document). 2016: iFISH arises as DIS Explorer for the Designing Intereactive Systems 2016 Conference, Brisbane. 2015: Check out ChiFish at the 2015 OzCHI Conference. 2105: Teachers in the UK are using iFISH to explore teaching resources on the Primary Science Teaching Trust web site. 2015: Bookfish is a cool way for young readers to find new books to read. 2014: If exploring Science Blogs is your thing, see this example of what a group of Science Communication students did in 2014. Explore people in the Interaction Design Lab research group at the Uni of Melbourne. We are playing with exploring restaurants here. Playing with Myer-Briggs personality types. And even political parties with pol-iFISH! MINE - exploring interests. This is a study by my PhD student Rob Ely. More info on his fascinating project here. It's exploring rather than searching. iFISH is a project investigating ways of exploring an information space when you really don't know what you are looking for but have an idea of the kinds of things that you like ('preferences' or 'tastes', we call them). For example, you are looking for a restaurant. The kind of things that you know about are your desires: something romantic, fairly quiet, not too modern, but not exactly traditional either. Definitely not spicy food. These kind of criteria are not easy to specify in Google. If fact, you probably wouldn't want to use Google - you really want to be able to browse and explore easily. That's the aim of the system that we have set up (iFISH). It provides an environment in which you can explore data (such as restaurants) in a playful, friendly way and drive the exploration through your own preferences. Of course, this concept is not restricted to restaurants. We have ideas for books, wines, accommodation, nutrition, videos, educational resources, people's interests, even people themselves (see our 'Connecting Learners for Collaboration' project). So, our particular research interests are in using an engaging, affective interface to attract and maintain a person's attention, whilst at the same time trying to keep their focus on the task presented. Hence we want to encourage exploration with mind on task. You can find some some papers about this research here. Interesting things are added below in reverse chronological order (you need Flash Player installed) . We are producing a new version of iFISH that is based on HTML5, not Flash. That means it runs on iPads, Androids, etc. Yeah! We have constructed a back-end service in the cloud that facilitates: the easy creation on new ‘ponds’ (get used to our fishy terminology! ); the entering of ‘fish’ (data elements comprising name, description, images, and links to other online information); and the tagging info such as slider values and filter values. The nicest example to date is something we are preparing to help children discover new books to read. You can play at BookExploramatic. As of early November 2012, we have only 70 books, but we plan to have the entire Victorian Premiers' Reading Challenge list in there for 2013. What follows below are some older examples of our early ventures with iFISH. This old Flash version of iFISH was set up to display some of the research projects being undertaken by our department (Department of Information Systems, now the Department of Computing and Information Systems). Clicking on the fish gives brief info of the projects; clicking 'See more in a PDF...' loads a PDF brochure. This version of iFISH (with roots in Dundee, Scotland - when you're onto a name, stick to it...!) has a "school" of fish (a row) that stay together while the order of fish within the school change according to the slider settings. Also the rows themselves change. In this experiment Ruud Knieriem (a masters student from Utrecht University) investigated how people engage with online tasks. The research project is part of a Master study in Content and Knowledge Engineering at Utrecht University, The Netherlands, and is conducted under the supervision of the University of Melbourne. Supervisors: Jon Pearce and Gregor Kennedy. Results of this research will be posted soon. This is a version of iFISH (actually gFISH) that presents a set of subjects offered by a department (in 2008). All subjects remain on-screen at all times and they move fluidly as you change the sliders. Slider labels are sensible (unlike the original iFISH below!). Students can click the 'tools' icon on a fish and enter their weighting for any slider. Currently these data are manually aggregated with the existing ratings (well - not at the moment - but they were when we were running an experiment). You can run this version here, just click 'start' to begin (ignore the 'student number' request). Slider labels are not what we wanted for this version - they were created from a linguistic analysis process that effectively clustered subjects into groups and we added a label for each group. A better example of sliders with appropriate labels can be seen in the version 'Example of using iFISH to explore subject offerings" above. Here is the museum example with the animation turned off (and some sliders replaced by numeric steppers). Here is gFISH ranking cameras on various criteria. Tool to construct URLs for different versions of gFISH. Tool to change config files for iFISH.